Quality Yorkshire pork from outdoor reared pigs. For several generations my family have been rearing and breeding pigs in Yorkshire. About 16 years ago I decided to cut out the middle man and sell directly to you. I don’t have a shop or retail outlets but sell our pork produce at various farmers markets throughout North Yorkshire. A list of dates and markets I attend can be found opposite. I am also manager of Yorkshire Ridings Produce, a local farmers market group that stand at several midweek markets in North Yorkshire. My produce includes some extraordinarily tasty “proper” dry cured bacon, a large variety of lean pork sausages and various joints of pork, pork chops etc. Check out the produce page to see my complete range. Come along and try some today. You are assured of a friendly welcome and some damn good Pork and Bacon to take home. 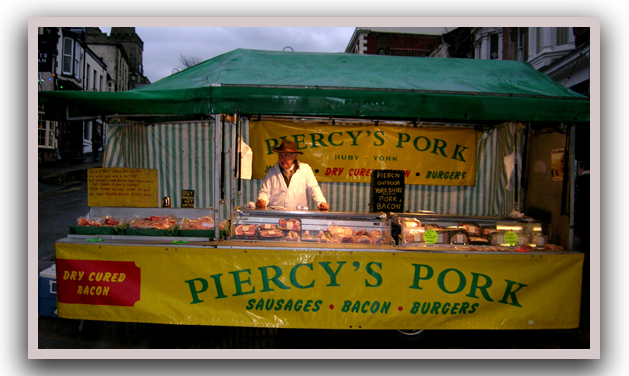 Piercy’s Pork will be standing at the following monthly Farmers Markets.